I'm in the middle of making another fun gift... wanna peek? 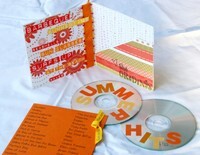 A SUMMER OF 2007 CD! CLICK ON THEM FOR MORE DETAILS! 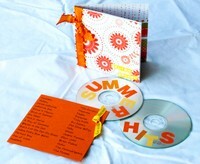 The CDs have all my favorite songs that remind me of the summer on them. From GreenDay to The Beach Boys... Fun!!! Here's my playlist in case you were interested! you seriously amaze me! how's the summer going? SO copying that! And SO glad you're back. I look to you for inspiration!! Welcome back! sooooo glad you are back...love this idea..where the heck do you come up with all this cuteness? you are so awesome! Where can I order one of those? Do you take debit cards? Seriously. Gillian, glad you're back! What a great idea! The funny thing is that last week, Jeremy mentioned (since we get a ton of visitors now that we live in SO Cal) that it would be funny to make a "California Hits" CD and play it on the way home from LAX whenever we pick up visitors. Can I buy one? I noticed you left out 2 Pac's "California Love"....probably on purpose! :) You are so CREATIVE!